If you are longing for peace, tranquility, and a cozy atmosphere, The Blue Owl is calling you. Nestled in the trees, this lovingly hand-crafted cottage is within walking distance to both beautiful Graham Lake and the ocean. The Blue Owl is fully furnished, with rustic wood floors and stained glass windows. Features include a kitchenette, screened porch, brick terrace, woodstove, and wi-fi high speed Internet. Upstairs is a private loft with a queen-sized bed, and downstairs is a 3/4 Murphy bed. Bedding, pillows and extra blankets are provided. The full bathroom includes an infrared sauna for two and a large claw foot bathtub. Bath towels and robes are also provided for your convenience. Visit our picturesque lakefront cabin, nestled in a secluded, natural setting of ten acres of garden and forest. Fully accessible by car, we are just a pleasant five-minute walk from the ocean beach. The cabin has two upstairs bedrooms, each with a comfortable queen size bed & lovely views of our acre of colorful gardens (& visiting wildlife). It has a newly-renovated, private tiled bathroom with shower, & a queen hide-a-bed couch downstairs. There’s a modern kitchenette with dishes & cooking utensils supplied, a washer & dryer, High Speed Internet & a TV/VCR with a selection of DVD’s & video cassettes. The wood stove & back up electric heat keep the cabin cozy. The new private swimming dock is ready for use & is an excellent location for wildlife viewing. Please visit our website for a full summary of our amenities. China Moon is a 6 minute drive from “downtown Denman.” Our B&B is connected to our home by a long hallway and features maximum privacy. Sundeck, living room, bedroom, huge bathroom with jet tub, wood and electric heat, plenty of space. Here you will enjoy complete seclusion. No traffic noise—only birdsong and the breeze in the trees. Our garden will amaze you.China Moon is one unit only—your party will have the place all to yourselves. Music/Internet/Satellite/frequent treats & surprises. Looking For a Tranquil Hideaway? Fillongley Forest Bed & Breakfast offers two Mexican influenced decor rooms with private en-suite bathrooms. The downstairs room features a double bed, private patio and Jacuzzi tub. The upstairs suite has a Queen bed and Roman tub. The spacious shared living space offers: Wireless Internet, Satellite TV, Fireplace, Full Kitchen, Kid and Pet-friendly. Each morning enjoy a Mexican breakfast of homemade tortillas, eggs, coffee, tea and juice, or a traditional breakfast. 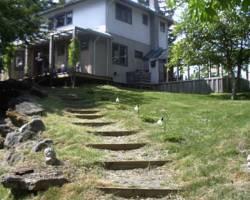 This retreat is situated amongst twelve treed acres with ocean and mountain glimpses. Accommodation is available within a bright, newly-constructed room, complete with private entrance, king-size bed, leather loveseat and chair, cozy woodstove, ensuite bathroom, satellite TV, wireless Internet and VCR. A private office area makes it a perfect retreat to work on an unfinished novel. Offers peaceful & private Denman Island accommodation in a self-contained one bedroom log cottage, overlooking the spectacular scenery of Baynes Sound & the Beaufort Mountain range. Bike & kayak rentals available. A wonderful natural outdoors playground for kids of all ages. Lognest is set amongst seven acres of forested land at the North end of Denman Island, & is ideal for couples or families of up to five. Enjoy the spectacular sunsets by relaxing in the hot tub after a day of walking/running/biking the neighboring trails, swimming at the beach, kayaking to Sandy Island Provincial Park or hiking to Morning Beach Provincial Park to capture the Denman Island sunrises. Comfortable rooms in a large private suite. View of the mountains and ocean. Amenities include cable TV and BBQ. Close to ferry, beach and shops. A jewel of natural peace on Denman Island. Sunset Beach Guest House has 3 bedrooms, each with outside access and its own outdoor seating area. The “porthole bedroom” has a queen bed, with ocean views. The second bedroom, queen bed, enjoys the morning sun. The third, queen bed, opens to the main deck and ocean views. The house has two shared bathrooms, a fully equipped kitchen is available, and the dining and living areas are combined. A television and DVD player are supplied, complete with a video library. The front of the SBGH has a deck with an outdoor dining area and a propane BBQ for use of our guests. Accommodation is ideal for couples, small groups or families. Located on ten acres of west facing ocean frontage. Idyllic setting.